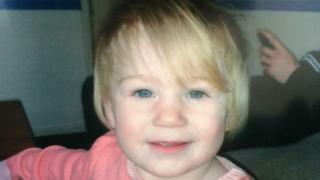 Fish have been poisoned in a garden pond created in memory of a 21-month-old toddler murdered by her mother. Ayeeshia-Jayne Smith was murdered by Kathryn Smith in May 2014. The toddler's father Ricky Booth said it "broke me" when he found vandals had poured disinfectant into the pond killing several fish. The 23-year-old, from Swadlincote in Derbyshire, said he built the pond after his daughter's death to symbolise a happy time they last shared together. Derbyshire Police said it was investigating the vandalism and has appealed for information. Mr Booth told the BBC he found about eight fish floating in the pond in his front garden on Saturday morning and contacted the police. "When I saw it... the anger is indescribable, I just lost it," he said. "It's devastating... it did break me... some low-life has done this deliberately." Image caption Mr Booth said he and Ayeeshia-Jayne had a "good little laugh"
Mr Booth said the memorial garden has kept him sane while grieving. "The last time I was with my daughter we fed some ducks at a pond and we had a good little laugh, that's the reason I made this pond," he said. "It is a big thing that has helped me cope. "It's not going to bring AJ back, but it's definitely keeping me on the right track." Ayeeshia-Jayne was stamped to death in her own bedroom in Burton-upon-Trent, Staffordshire, by her mother. Kathryn Smith was found guilty of murder and was ordered to serve at least 24 years in April 2016. This term was cut to 19 years due to her youth and "immaturity" in July. Smith's boyfriend Matthew Rigby was jailed for three-and-a-half years for causing or allowing the child's death. A serious case review found social workers missed signs of danger around Ayeeshia-Jayne and focused too much on the condition of Smith.